Drummer Steven Adler reunited with Guns N’ Roses for a pair of songs in Cincinnati, OH on Wednesday and video from the concert has surfaced online. 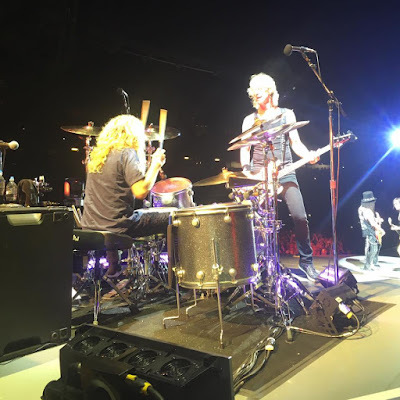 Adler joined fellow classic GNR lineup bandmates Axl Rose, Slash and Duff McKagan at Paul Brown Stadium for "Out Ta Get Me" and "My Michelle" from 1987’s “Appetite For Destruction”, marking his first appearance with the group since he was fired for excessive drug use in 1990. The drummer has long lobbied for a reunion with the band through the years and finally had his chance on the sixth stop on the group’s Not In This Lifetime summer tour. Adler was replaced by Matt Sorum in 1990 during sessions for the “Use Your Illusion” albums. The remainder of the 26-song set in Cincinnati remained similar to other shows on the summer run, which will continue at Nissan Stadium in Nashville, TN on July 9.